If you are looking for ideas on what to do in your spare time or when you invite some friends over and want something fun but relaxing at the same time, then this might be just the right thing for you. 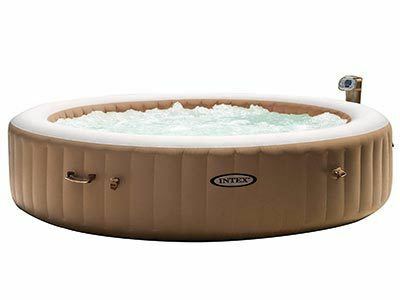 The Intex 85in PureSpa inflatable hot tub set. I mean who doesn't enjoy a nice relaxing Bubble Massage on a hot summer day while drinking their favorite cold beverage along with family and friends? Even better, why not do this all year long, since it is portable? Installation is fast and easy, some say it took them 10 minutes for installing it and 30 minutes filling it with water. It's large enough to fit 6 people and small enough to fit in your basement or garage when the weather outside is not so pleasant for a relaxing massage. Also, because it is portable you don't have to leave it home when you are going away for holiday, you can just pack it up in the carry bag that comes with it and just take it with you. Great Construction: You are probably wondering how this Portable Spa Set is capable of massaging 6 people at the same time. That's because it is equipped with 120 heated air bubble jets that can be controlled at the touch of a button from the control panel, which will heat up 290 gallons of water at you preference between 68 and 104 degrees Fahrenheit. The electronic hard water treatment system filters the water of calcium and other unwanted minerals, which remain in the filter cartridge that can also be replaced easily. This not only makes the water more soft and enjoyable to the skin but it also increases the efficiency and life of the PureSpa. Constructed from three-ply laminated material, enforced with lightweight strength fibres to provide exceptional durability and comfort, also thanks to the Fibre-Tech Construction technology, it provides very good stability while still offering a comfortable surface. The PureSpa inflated inner and outer measurements are 65 inches and 85 inches and the height is 28 inches. Easy To Handle: If you are thinking that this is going to give you headaches to install and maintain it, is not going to. The maintenance is just as easy, all you have to do is replace the two filter cartridges from time to time. Here is a tip for you, if you know that the water where you live is full of minerals you might want to acquire some extra filter cartridges. Perfect For Different Ages: Our Intex 85in PureSpa Portable Bubble Massage Spa set does not come with an age limit. Due to the fact that it can be transported anywhere, to any location and any weather condition, you can take it with you both on vacation or on business trips. Here are some targeted categories that can use it. If you are a parent and you are planning a barbecue with some friends and want to keep your kids busy? Then take the bubble set with you and no longer worry about how they could spend time, while you chat with your friends and relax. Also, suitable for the children. A small pool is exactly what you need! Invite your friends over to have a bath in this pool and your friends will always envy you! No matter if you are an elder person. A relaxing massage pool will help your muscles detach from pressure and will calm your body. With the usage of medicinal salts and plants, a warm bath will make you feel as if you were a teenager. Style of this hot tub is also great for the professionals. After a long and rough day at work and you want to forget it for 30 minutes? You can have your own free and relaxing time with this bubble bath, leaving all work duties aside and focusing on your health and happiness. To be honest, there are a few small issues. The original filters are thin as paper so you need to be extra careful when you install them. One user has reported that the heating system does not keep up with the surrounding temperature. If it is cold and if the bubbles are on they reduce the water temperature from 104 to 100 degrees in about 20 to 30 minutes. Basically, this hot tub might not have original filters of a high quality and you would need to buy others when they broke. However, most of the customers are really pleased with Intex 85in PureSpa Portable Bubble Massage Spa set, due to the fact that they can have both fun and relaxing moments alone or with their friends. This product is recommended for children who enjoy taking a bath with bubbles or parents who want to spend some time alone, while their children play with their friends. The massage spa set is also recommended for old people who have muscle pain and are looking to buy a relaxing pool, while businessmen can have a moment for themselves, forgetting about work projects or difficult customers and partners. Therefore, if you are looking to have nice moments at a nice price, then the massage spa set is the right product for you.